The Gilt Club has been on my list for quite some time. I had read that they were supposed to have a good burger, that’s what made me put them on my list. Well yesterday it came up on Groupon, and just so you know, through April 7th it will still be available on Groupon. I grabbed the deal and went to Open Table and made reservations immediately. The first thing we noticed is that they have a huge menu of house infused vodkas, gins and bourbans. There might be other things, but that’s what caught our eyes. We promply picked a infused alcohol of our choice and found a drink to match it. I personally ordered the Strawberry Brunette and the Berried Alive. Both with fruit flavored vodkas. I hontestly can’t tell you which one I liked better, as they were both awesome. Neither was over sweet and both had a great combo of fruit and herbs. LOVE! I really wanted to order an appetizer or salad, but we skipped that and went straight to a salad to share. 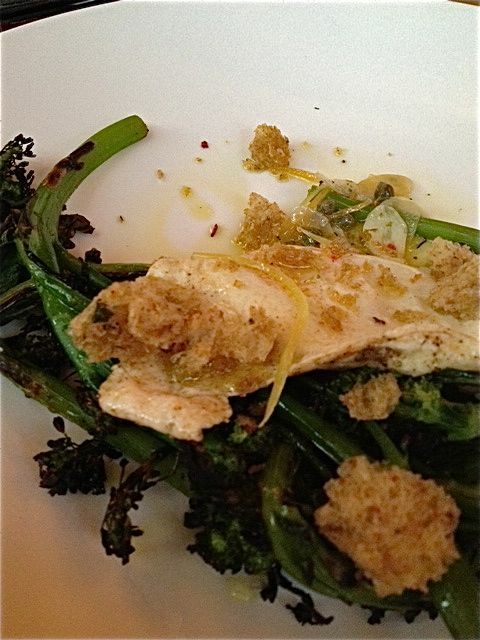 The charred broccolini with a fried egg. I really do like my eggs and I really do like eggs over veggies. This was a huge hit for both of us. A nice blend of garlic and a great little sauce over the top. A bad picture of a great burger! My husband ordered the hamburger, since that was of course the reason for our visit. It was really good. I do like my beef and it was good beef and the toppings were perfect, not over the top and they did not hide the taste of the beef. My husband said if it wasn’t for the bun it would be the best burger in Portland. I agree, the bun wasn’t the best and it’s all part of the package. But still a great burger worth trying. 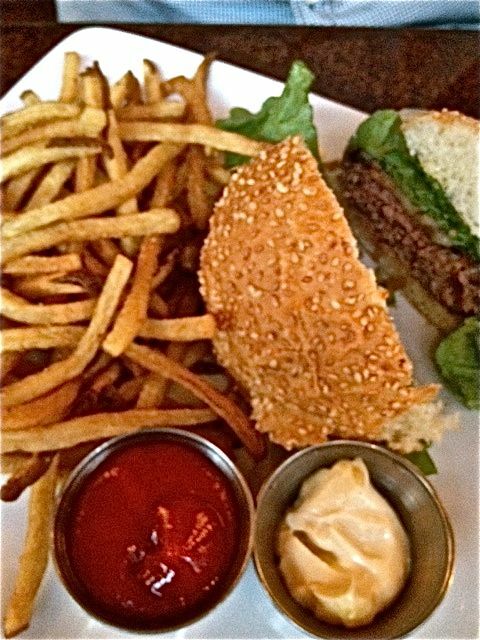 The fries were great and who doesn’t love aioli. I ordered…..the Pork dish of course. 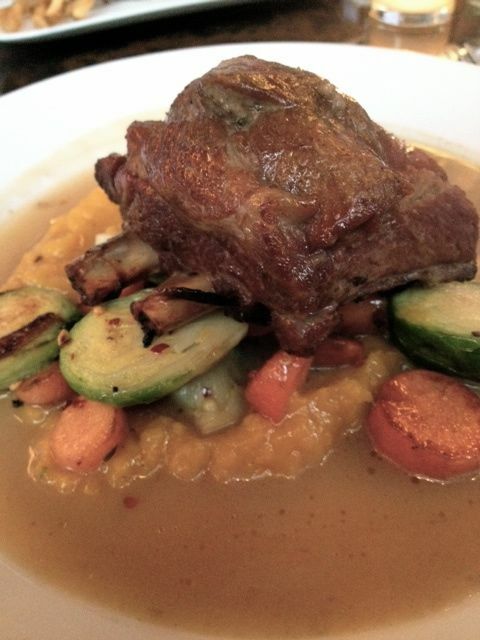 It was Pork short ribs with squash and brussel sprouts. If you have read my about page you know I like Pork, if you have ever looked in my fridge you would know that I really like Brussel Sprouts. This was an easy sell for sure. The ribs were placed atop a squash puree also a top a sauce. The dish was fantastic. It’s one of those dishes that you that you really want to get bread so you can get ever last drop of the sauce and squash because it’s so good. Thank you Gilt Club for a fabulous meal. Sorry I waited so long to get there. In the end our meal was just over $40. The Groupon was spend $20 and get $40 worth of food, making this meal very affordable. Since we got such a discount on food, we splurged on drinks. Grab the deal today. Atmosphere was very cozy. The tables although tight were fine. The bar is small, not sure if happy hour is served just in the bar or not. Pricing was pretty average for what you would find in Portland. A bit steep for a burger, but for the fresh local beef, it was worth it and you could taste the difference. The cocktail list was off the charts. So many options available. The beer list was not great, but when you have a cocktail list like that, you don’t need anything else to really shine. The service was great. I always do have a ton of questions when I go to new places, so I appreciate when they take their time to help us out and guide us. Our guy was great! Everything was fast, prompt and perfect. No complaints whatsoever and the place was pretty busy. 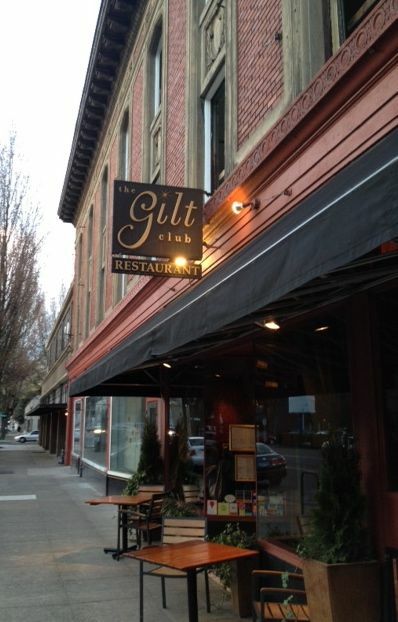 The Gilt Club is located in the Pearl.